This is a biggie. We can officially add “master electrician” to Wayne’s resume. His masters in Electrical Engineering came into handy. He rewired the entire electrical system of the home. Removal old wires: Hanging out in the hot hot heat of the attic removing the old mickey mouse electrical wires. Wayne-gyver Wireman: Pulling wires from the attic and through the walls to the outlet boxes. He eventually built a jig to unravel the wires so he can give me a break from feeding him the wires. 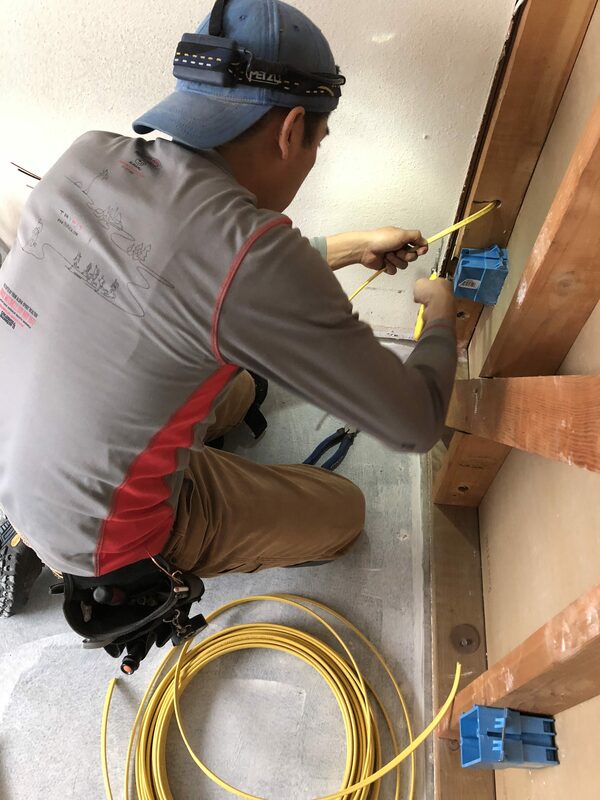 Electrical outlets: Installing 45+ new electrical outlet boxes to the wall studs and wiring all the boxes. We designated a hall closet to be our “utility closet”–housing our coaxial cables, Ethernet, and wifi–in a handy dandy structured media enclosure (see below). Cool outlets worth installing: An outlet that includes a USB charging port at the kitchen peninsula wall. Also an outlet with a built-in night light. LED recessed lighting: Installing 45+ recessed lighting canisters, junction boxes, and recessed LED bulbs. Light switches: Installing 15+ wifi-enabled light dimmer switches and regular switches. Connecting all the wires to the newly upgraded electrical panel. We hired a professional, Ryan Electric, to do the last bit.